This is not a complete tree! 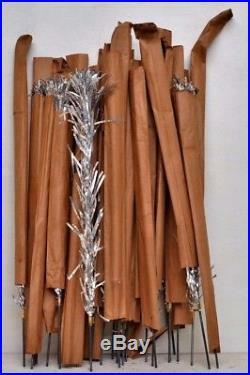 Included in this sale are 32 branches for an aluminum tree. We are not sure what tree these belong to. The branches appear to have never been used. 17.00 inches long, each branch from metal tip to pom end. This item is being stored in a climate controlled, smoke and pet free home. This sale comes with no other guarantees than what is stated in the ad and what appears in the photos. This is an older item, there may be dust or other imperfections due to age and/or use. View all photos, ask questions, what you see is what you get. Thanks for looking & happy shopping! The item "Lot of 32 17 Aluminum Tree Branches PARTS ONLY Mid Century Vintage Christmas" is in sale since Tuesday, November 07, 2017. This item is in the category "Collectibles\Holiday & Seasonal\Christmas\ Modern (1946-90)\Artificial Trees". The seller is "ruthhannas" and is located in Little Rock, Arkansas. This item can be shipped worldwide.